In the early 2000s, Onesphore Mpakaniye, 70, used to walk 10 kilometers from Ngarama Sector in Gatsibo District in Eastern Province to process travel documents at former Murambi Commune offices (current Kiramuruzi Sector). To get to the local administration location on time, Mpakaniye would leave his home in Ngarama at 2am – to start the long journey. “You had to endure that long walk to access government services. Not everyone would manage this hard exercise,” Mpakaniye told KT Press. The elderly father of six had been enduring this walk whenever he needed to access local government services such as birth certificate and travel documents. Mpakaniye’s relief however, would only come three years ago when government started a new system to offer its services online. 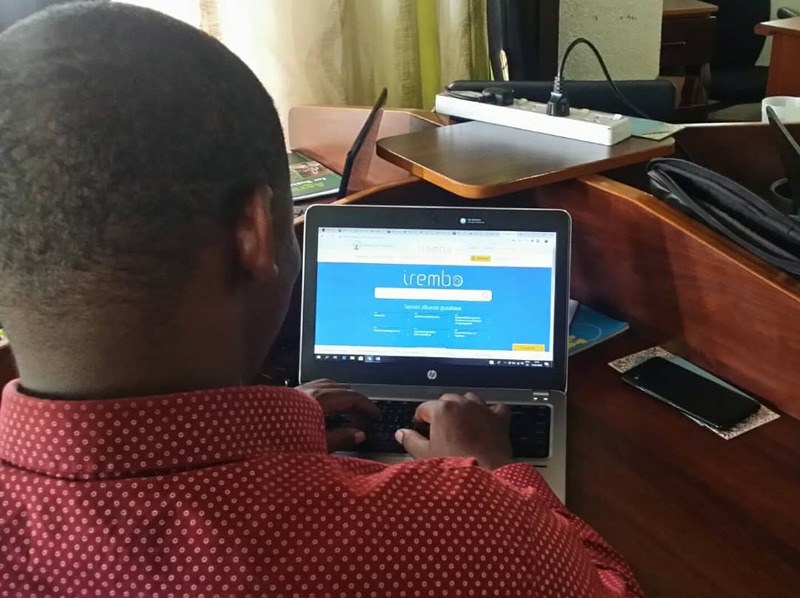 In July 2015, government through Rwanda Development Board (RDB) entered a 25-year contract with Rwanda Online – a private local tech company to design and operate Irembo – a portal to all government services. Last week, KT Press conducted an assessment to comprehend the story behind this online portal especially looking at; how it operates, services it offers and the impact it has had on both government and citizens. In an exclusive interview with Jules Ntabwoba – Spokesperson of Rwanda Online, KT Press discovered three key things that Irembo has been driving to help both government and citizens enjoy benefits. First, Irembo has saved government from incurring losses due to corruption implicated in the former manually-offered services. Second, Irembo has provided a platform that offers these services in transparency. Lastly, the platform has cut down on the time spent by public to get these services. However, KT Press also unearthed tendencies of malpractices in the process. According to Jules Ntabwoba, three years down the road, 5,932,314 transactions or nearly half of Rwanda’s 12 million population sought services via Irembo portal. In December 2018 alone, according to Ntabwoba – 258,243 transactions were made. Government has since earned billions worth of revenues from this online portal. Both Rwanda Online and Rwanda Revenue Authority – the custodian of these funds, according to Jules Ntabwoba, declined to reveal the figure government has collected through Irembo-offered services. KT Press spoke to Richard Hakizimana – Commissioner for Finance Department at Rwanda Revenue Authority, who declined to reveal the amount collected through issuance of online services. “We are not allowed to provide such information. May be those officials (Rwanda Online) can contact Commissioner General to discuss the purpose,” Hakizimana responded in a text message to KT Press. It costs Rwf500 to obtain a birth certificate which is the same amount paid while applying for a national ID and marriage certificate. It also costs Rwf5000 for application of a provisional driving licence provided by Rwanda National Police. As of last year, more than 10,000 people were on the waiting list to pick their driving licences after passing driving tests. All these had processed payments of Rwf50, 000 via Irembo in order to obtain the driving licence. Currently, Rwanda Online offers 90 services via Irembo portal. There is no specific number of services that government offers. But according to officials at Rwanda Online, Rwanda Governance Board (RGB) is currently conducting a general assessment to come up with the exact number of services offered by the government. Despite Rwanda Revenue Authority not availing figures of amounts collected out of online service payments, it is evident that, since the online portal was established, cases of corruption through issuance of services have declined. KT Press spoke to Rwanda’s Ombudsman Anastase Murekezi, who highlighted a case of payment of Health Insurance Scheme (Mutuelle de Santé) that are now done in a transparent manner. “We used to receive several complaints from the public who pay insurance fee, but do not find themselves on the list. This was mainly caused by people who used to manually receive money in cash and swindled it,” Murekezi said. “The online service has greatly contributed to reduction of malpractices,” Anastase Murekezi added. Julius Karenzi – a Kigali-based banker seeks Irembo services on a regular basis. However, he has to seek agents to conduct the process for him. “The system is not easily accessible. Sometimes I give up in the middle of the process,” Karenzi told KT Press. There are 8 steps one has to go through to process payment via Irembo portal. While many other users claimed the service to be unfriendly, Jules Ntabwoba told KT Press that Rwanda Online is aware of the issue. “We are currently re-engineering the portal. We believe the issue will be solved before end of this year,” he said. You could have seen several agents offering Irembo services. But what you probably could not be aware of is that those are not either government or Rwanda Online employees.